Cut the front and back the same as for a six-gored skirt, and combine the first and second side gore to make one gore; a dart will need to be taken out of the center of the top of this gore or the fulness cared for by tucks or easing into band. Pig. 65. 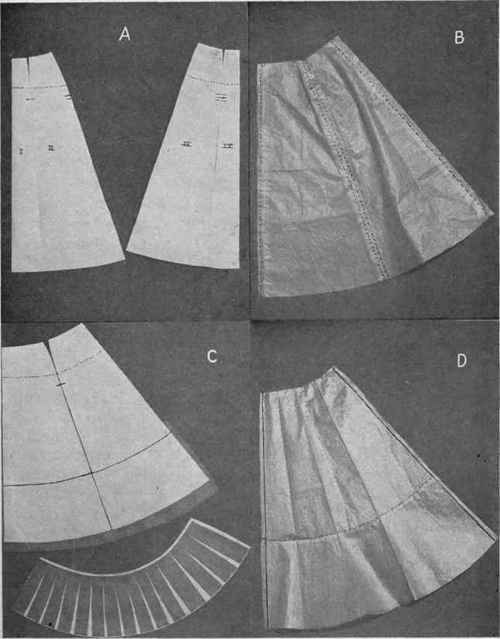 - A, method of combining pieces of six-gored skirt pattern, to design a four-gored skirt; B, completed design; C, method of designing circular flounce from skirt pattern; D, completed design. Circular skirts, like gored skirts, may be narrow, medium or very wide. 1. Medium Circular Skirt. 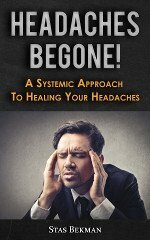 - Place the pieces of the six-gore pattern together in regular order, meeting at the hip line, the two side gores lapping slightly just above the hip line, and the bottom of the gores separated sufficiently to give the desired width around the bottom. Do not separate the center front and first side gore quite as much as the other. The slight overlapping above the hip will not affect the fit of the skirt because of its being bias over the hips at this part. Mark around pattern and cut skirt out, allowing one-half inch seam center front, center back and waist, nothing at the bottom (Fig. 66). 2. Wide Circular Skirt. - Place the pattern as before, overlapping at the waist, but separated enough at the hips and bottom to give the desired width (Fig. 66C and D). Mark and cut out the skirt as designed; it will be too small at the waist. This can be remedied by: (1) the insertion of a triangular piece of cloth using embroidery or braid to conceal the seam, or (2) the use of a yoke. Very wide circular skirts may be remodelled to accord with the changes in fashion by folding in plaits at the side and covering the top of them with an ornament or by slashing the skirt and arranging fulness in gathers set under a plait and finished with a strap ornament or series of buttons. 3. Narrow Circular Skirt. - Place the pieces of the pattern so that they lap at the bottom and separate at the hip line (or below) and waist. This gives fulness at the waist line, to be removed by tucks, plaits or gathers. 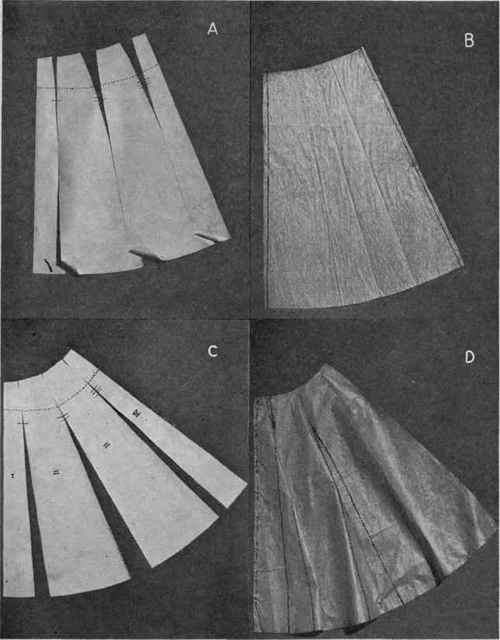 This narrow skirt may be exaggerated to the extent of producing a peg-top model (Fig. 66A and B). Mark and cut according to previous directions. Sometimes one wishes to design a circular flounce for the bottom, or other parts of a skirt, or for use in sections for a lace-trimmed petticoat. To design a flounce which is the same depth at all points, proceed as follows: Lay the pattern of the skirt on a sheet of paper on the table, placing the gores together at hip and bottom, measure up from the bottom (center front) the depth the flounce is to be finished. At the side, measure one-quarter inch more than at the front, and in the center back, one-half inch more than in the front; draw a line touching these points and trace it through the pattern to the paper beneath. Cut out around the bottom, center front and back of the pattern; remove and slash this circular piece at intervals of one to one and one-half inches to within one-sixteenth inch of the top. Lay this on a sheet of paper and spread apart until the desired width is obtained, being careful to keep the top of the flounce smooth so as not to make it too small to fit the skirt. Cut the skirt from the upper part of the pattern, omitting the amount used to design the flounce. Allow seams on both skirt and flounces (Fig. 65C and D). Be careful about the depth of the circular flounce, that it does not cut the heighth of the figure. The same principles apply to the designing of a flounce that is shaped at the top. The depth of a flounce must be in accord with the heighth and breadth of the. figure. Fig. 66. - Method of designing circular skirts from six-gore pattern; A, combining gores for narrow skirt; B, completed design; C, combining gores for wide skirt; D, completed pattern.